Place the whole leaf underwater to hydrate for several hours, then store stem side down in a bucket of water. Before working with a leaf, warm it with your hands to “relax” the ribs. I am not botanically inclined so use the common name versus the botanical name. I hope this doesn’t confuse you. Gail took a Flax (mother-in-laws tongue?) and split it down the middle to 2 to 3” from the top. She cut one side 1 1⁄2 inch shorter and stuck it into the oasis or kenzi. With one side being shorter, it opened up the Flax to give a very interesting design. 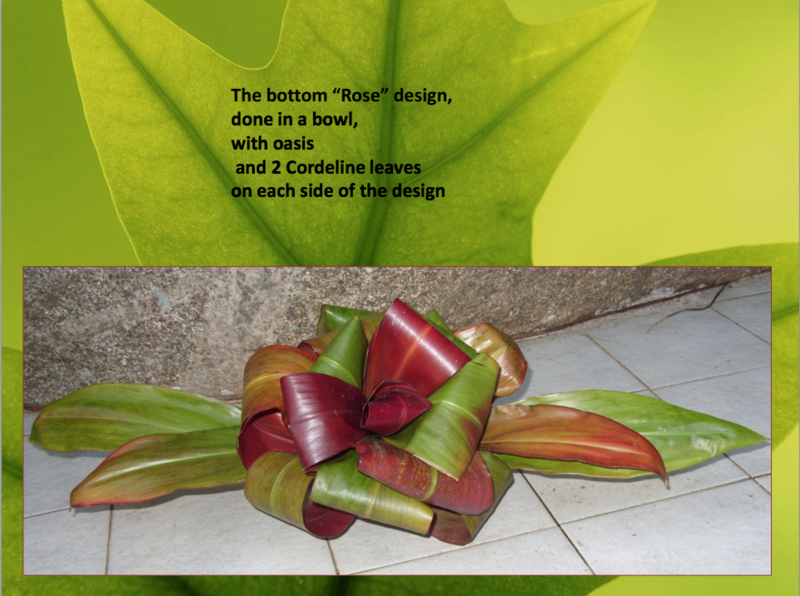 Gail took what looked like a Prayer Plant Leaf, pleated it on one side and stapled it in place. It made for an interesting bit of greenery. 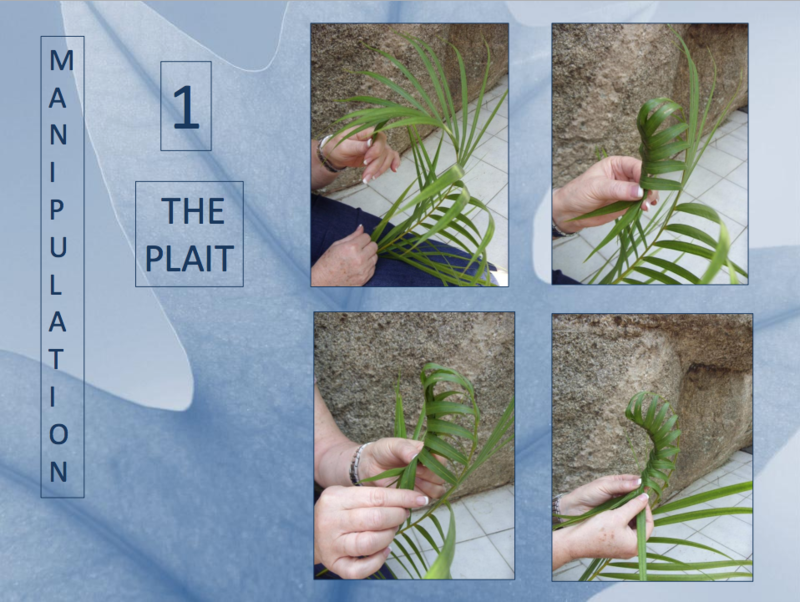 She showed us French Braiding with the Flax Strands and also with a palm leaf which was spectacular! Using the Flax again, she tore it into strips, the outer two whiter strips and three or four in the middle of the Flax Leaf. Taking an outer strip she wove it through the middle leaves, press to keep the plant material in position. 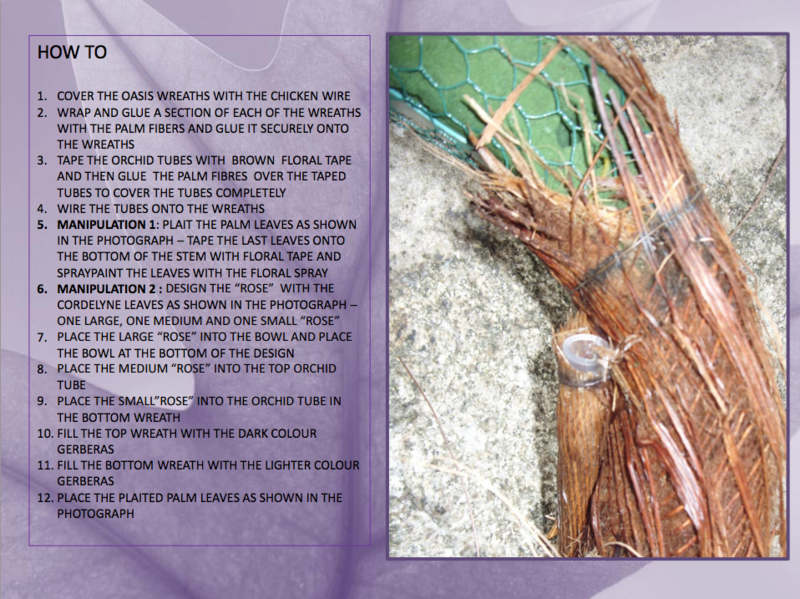 Pick up the whiter part of the plant material on the other side and do the same. weaving the same piece back through to the other side, repeat until the whiter strips has been woven into the remaining part of the leaf. 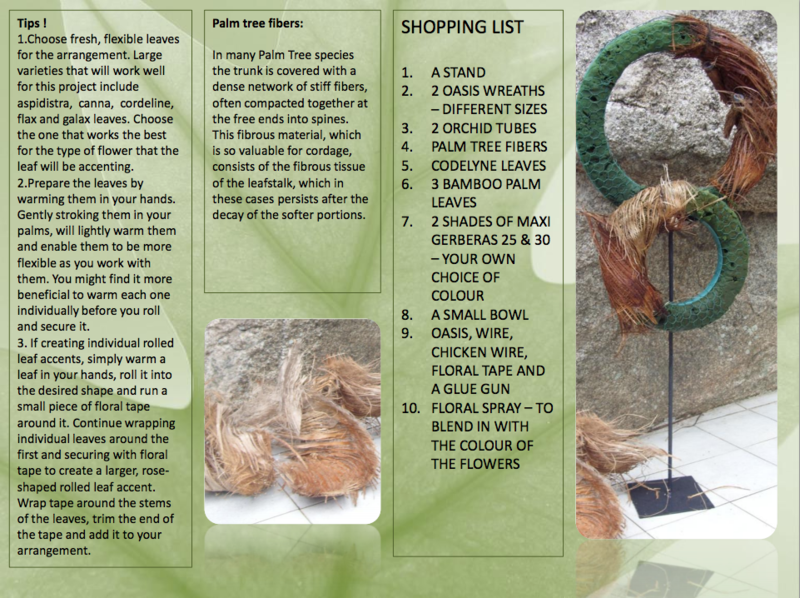 Split the Flax down the middle, 2” from the top& tuck pointed end through the split portion of the leaf. Gail recommended using Glue dot (best kept in the freezer in a Ziplock Bag) or clear two-way tape. Shopper’s Drug Mart has the strongest two way tape for using with plant material. Canadian $$ Stores sell staples in colors. Green to staple plant material into position is great. 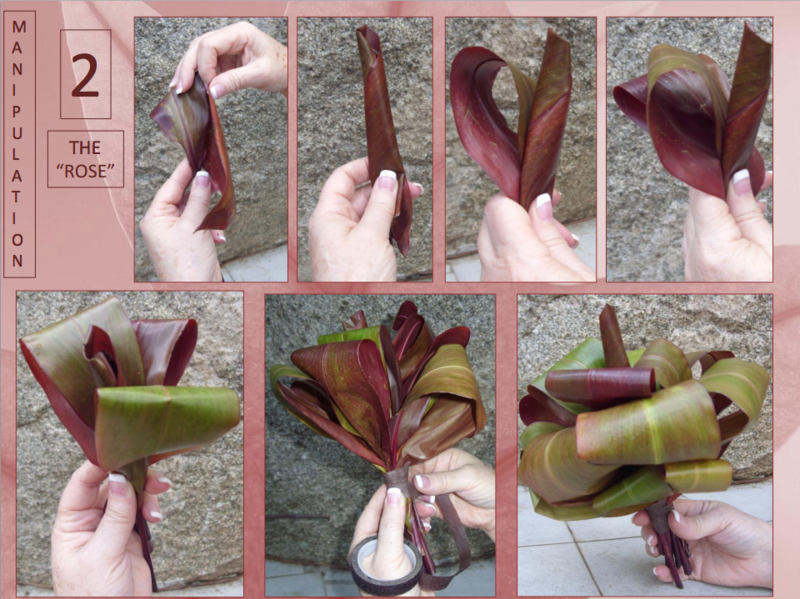 Bird of Paradise Leaf, tear leaf to middle at 1⁄2 inch intervals on one side. On the other side of the leaf 1⁄2 inch from the edge make 1⁄2 “ cuts along the edge of the leaf. Tuck the shredded side into the cut side for a special effect. Horsetail .. stick #18 wire down the center of the horsetail and and mode into a ball. Use as many Horsetails as need to increase the size of the ball to your desire. confused and curious in their use of floral design. 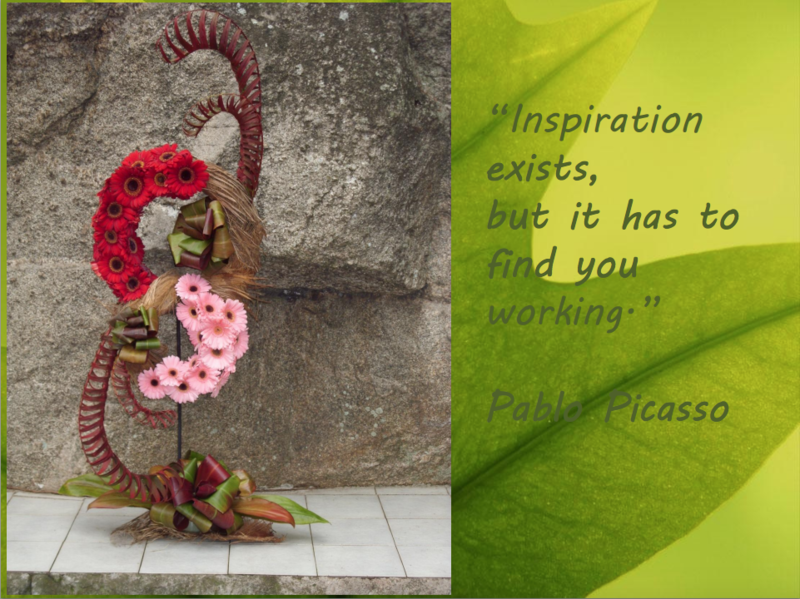 Roberta made several varied and creative arrangements with, not only different flowers, but many leaves that can be pulled from your garden and cut or manipulated into focal pieces that will add to your arrangement to make a “wow” statement. floral arranging easier. Her suggestions were, floral netting, wood picks, clear floral tape, clothes pins, case cutters, floral stem wire, any spray paint. Jan Quarton and Leslie Martin explained the fox tail fern and jatropha plant. Then Jan had a drawing for a fox tail fern. Meeting was held at the home of Nancy Daniel. Sharron King brought cookies and pastries. Mary Bragg the floral arrangement and fruit.